-Irma Rodriguez, in prison on drug charges. While in prison in 1990, Irma was diagnosed HIV positive, but after a decade and a half of aggressive and toxic treatment, Irma learned that she never had HIV. -Sheri Dwight, a domestic violence survivor who was sent to prison for attempting to kill her batterer. While in prison, she underwent surgery for abdominal pain and learned more than four years later that she had been sterilized without her consent. 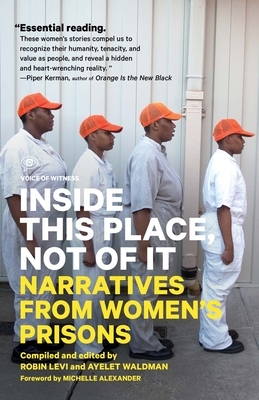 "A chilling glimpse of the human rights abuses suffered by women in U.S. prisons... a captivating read." "Inside This Place, Not Of It is precisely the kind of book we need now. In reading these narrativesso skillfully assembled, and with the accompanying statistics and data which let readers see how America and its states are complicit in taking away lives and dignity from so many womenwhat stands out is the poignant sense of abandonment and sadness that changed their lives from childhood, and the astonishing strength and perseverance that let them survive in prison. I will never forget these women, or this book."